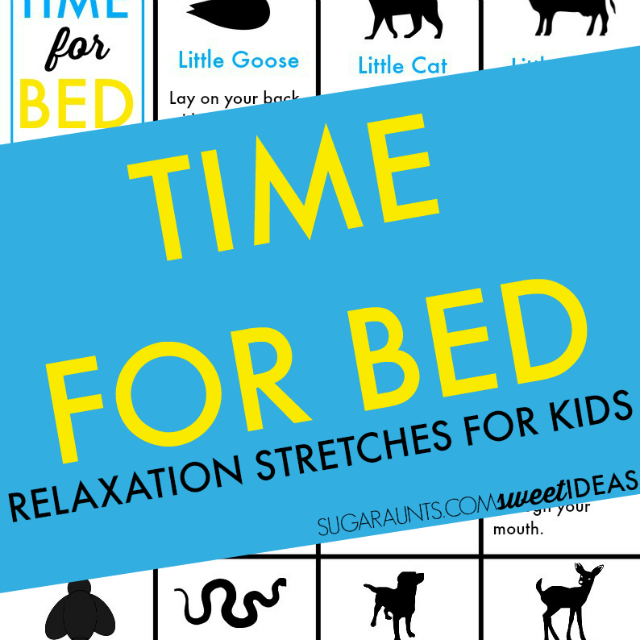 In this post, you will find calming bedtime relaxation stretches for kids and families, based on the popular children's book, Time for Bed. 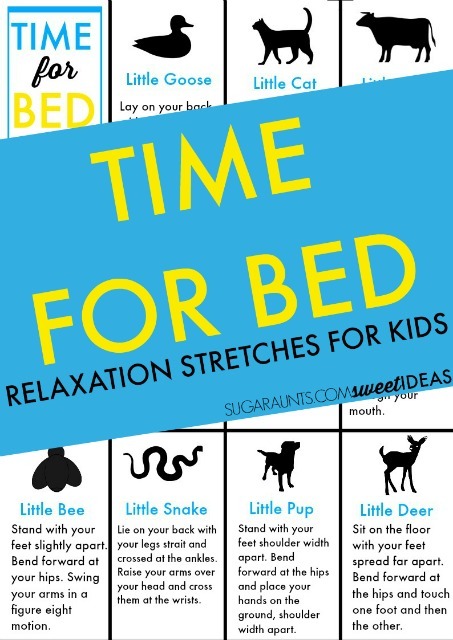 These activities are perfect for helping kids calm down before bed. Four kids can get a little wound up before bed. All it takes is one rouge energy burst and you've got giggling kids bouncing from every surface imaginable. Couch cushions? check. They are jumping up and down. Running from room to room? Check. There's two of them chasing one another back and forth will the occasional knee slide across the hardwoods. Practicing the living room tumbling skills? Yep and check. There's one more doing somersaults across the room. Why must they gang up on me with their endless energy during those exhausting pre-bedtime hours? Today, I'm sharing a great way to calm down the somersaults and hardwood floor stunts into relaxing bedtime. One way that helps to get kids relaxed before bed is reading a great book. When kids can listen to an engaging story that is read aloud, their bodies can't help but slow down. When books become part of a nightly bedtime routine, it is easier to get kids to realize that bedtime is coming. One great trick for helping with the transition from living room stunts to snugly blanket stories before bed are some relaxation stretches. These bedtime relaxation stretches are a combination of relaxing yoga moves and heavy work that helps to ground the body through proprioceptive input to the body's sensory receptors in the muscles. Performing these relaxing stretches can help transition kids to a calmed state that allows for a better sleep. We decided to use one of our favorite going to bed books, Mem Fox's Time for Bed. In the book, we hear a rhyming verse about each animal's transition to sleep. It's such a beautiful book to snuggle up with kids during night time routines. In fact, Time for Bed can easily become one of those books that you read over and over again. We loved looking at the watercolor pictures in Time for Bed and picturing each animal as it got ready for sleep. 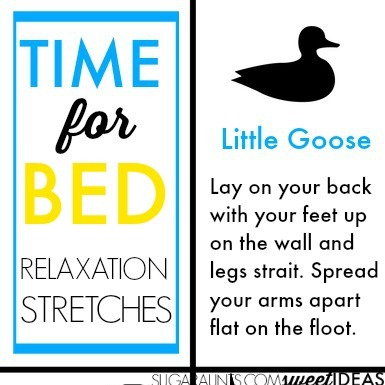 To go along with the book, we tried some of these bedtime relaxation stretches. Grab your copy of the free printable here. To do these exercises, simply cut out the printable on the lines, and create a small stack of stretches. 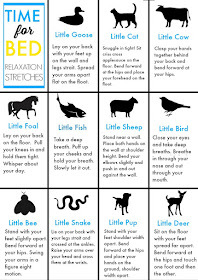 Kids can do one or more of these relaxation stretches to calm down before settling in with the Time for Bed book. Simply pull out a couple of the stretches and join your child on the floor to perform each stretch. The stretches are designed based on the animals in the book. When doing the stretches, hold the stretch for 2-3 minutes while maintaining deep breathing. As we all know, kids will be kids. 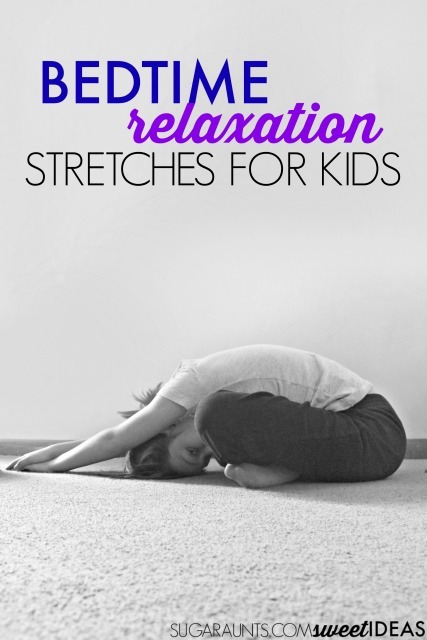 If your child is getting too wound up from the stretches (because sometimes the sleepy sillies take over and make concentrating on stretches and relaxing deep breaths nearly impossible!) simply put the stretches away and try them another day. 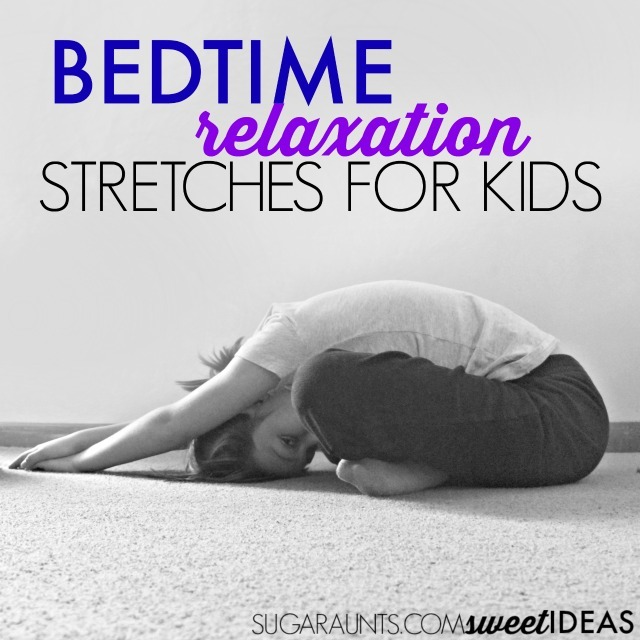 Your child will love doing these bedtime relaxation stretches with you and the whole family! Little Goose Stretch- Lie on the floor on your back, with your feet raised up on the wall. Keep your knees strait. Spread your arms out on the floor like a goose. Bend and point your toes slowly. Little Cat Stretch- Snuggle in tight! Sit criss cross applesauce on the floor. Bend forward at the hips and place your head on the ground. Stretch your arms out on the floor over your head. Little Calf Stretch- Grasp both hands together behind your back. Bend forward at the hips and raise your arms up behind you. Little Foal Stretch- Lie on your back and pull your knees in with your arms. Hold the position and whisper about your day. Little Fish Stretch- Take a deep breath. Hold your breath in your cheeks and puff out those cheeks. Slowly let out your breath with pursed lips. Little Sheep Stretch- Stand facing a wall and place your feet shoulder width apart. Place your hands flat on the wall, shoulder width apart. Push against the wall by bending and straitening your elbows. Little Bird Stretch- Close your eyes. Think about your day and take deep breaths. Breathe in through your nose and out through your mouth. Add a "wing" component by raising your arms up high as you breathe in and lowering them as you slowly breathe out. Little Snake Stretch- Lie on your back on the floor. Keep your legs strait and cross them at the ankles. Place your arms over your head on the floor. Cross them at the wrists. Little Pup Stretch- Get into a downward dog yoga position. Little Deer Stretch- Sit on the floor with your legs strait. Spread them far apart and bend at the hips to touch one foot. Hold it and then stretch to touch the other foot. Try this tonight! 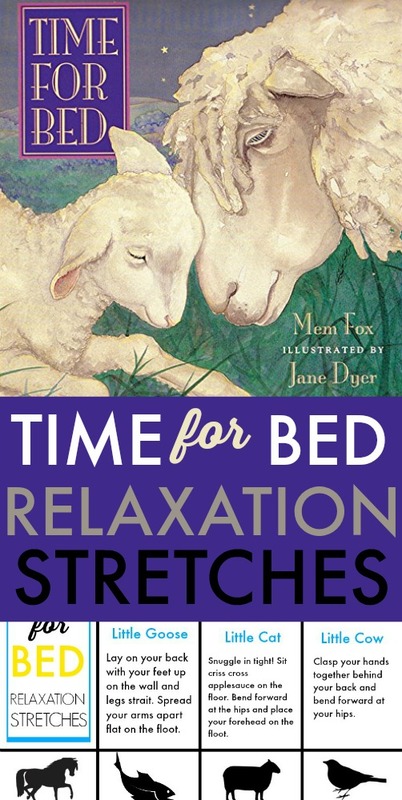 Do a few stretches and then snuggle up while reading Time for Bed! One more thing! If you are into creative ways to extend and learn based on books, you will LOVE this resource! 50 activities based on books that address friendship, acceptance, emotions...This ebook is amazing and it is HALF off this week only!